I have to admit that this was my very first time watching a VeggieTales movie. My big sister and brothers have seen them before and while there are a few movies in the house I have never been one to grab them and watch. I am so sorry that I haven't because I have been missing out on so much. 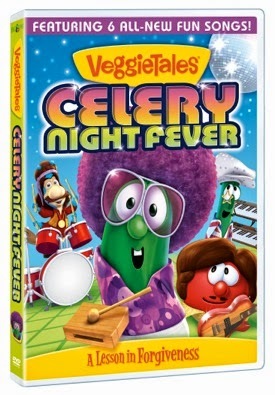 The brand new Veggie Tales Celery Night Fever available for purchase now teaches the story of forgiveness. Old bandmates from The Groovy Brothers, who have simmered in their own juices over a decades-old falling out rediscover, their friendship. The nefarious Bruce Onion peels back the layers of his bitterness toward the band and learns to be sweet. And Laura Carrot, after cutting her best pal Junior Asparagus out of her life over a mistake he makes, decides everything is better when they’re like two peas in a pod. The Bible has a lot to say about forgiveness – and not just its ultimate expression of God forgiving our sins. Many other verses address the importance of us forgiving each other and the benefits doing so brings to relationships. Everything really is better when realize we’ll all in this big salad of life together! Love and forgives go hand-in-hand – even for animated vegetables! With this being my very first time watching a Veggie Tales movie I was really surprised that it kept my attention the way it did. The animation really intrigued me complete with the songs. My favorite song was actually "Tear the Park Down". I actually tried singing along. I'm sure your little one would too. I know that I had a difficult time trying to forgive my brother for wanting to take my movie off so he could watch something else. I started screaming and actually hit him. That's what he gets! In the end he was forgiven because he ended up watching it along with me and loved it too. I recommend everyone getting a copy of Veggie Tales Celery Night Fever. You would love it as much as I did! This movie gets my TWO TINY THUMBS UP! Win a copy of Veggie Tales Celery Night Fever DVD and help your little one discover what it means to forgive. Winner will be randomly selected by PunchTab and will have 48 hours to respond to the email sent. Failure to respond will mean forfeiting your prize and a new winner will be chosen. Good luck! Forgiveness and learning how is important. I think this DVD should be watched by all little ones! Sounds like a great movie! Veggie Tales is one of my faves! I love Veggie Tales. When my girls were little that is all they wanted to watch. I am glad they are still bringing out new stuff for futures generations. what a good movie I still enjoy watching the Veggie Tales movie so cute/. Veggie Tales movies are so cute. I love that they are wholesome entertainment that the whole family can enjoy together! I always enjoyed Veggie Tales when I was a kid! Glad to know they're still making great movies that teach life lessons today! We love Veggie Tales and watch them frequently. They're entertaining for everyone and have great messages! I like veggie tales movies because they are good wholesome kids movies. My kids love it. But for me its kinda of annoying.